With every mobile device in the hands of your employees, you are providing a point of access to your corporate network. For your IT teams, that means multiple dimensions of risk to manage—at the device level, the data level, the user level, and the network level. Establishing a sound strategy for mobile security is essential to protecting your enterprise against this risk. And with mobility solutions from VMware AirWatch®, you’ll be on solid footing to defend your data. End users want access to data anytime, anywhere, and businesses appreciate the collaboration and productivity such access allows. But access exposes enterprises to risk, and compels a mobile security strategy that can keep the threats at bay. 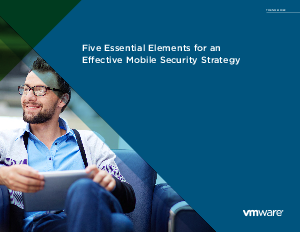 In this trend brief, we will review the essential elements of building a mobile security strategy, and how VMware AirWatch solutions make it possible to construct your strategy and gain broad user acceptance. To learn more of how mobility management solutions from VMware AirWatch can help you implement an effective mobile security strategy, download this whitepaper.